Government Officials hold the best services and respect in India. The fact they are being given the best facilities is that they work for nation so they shouldn’t be dealing with any kind of inconvenience. Government job is considered as the safest and high paying job. The officials working for government are entitled to have best possible facilities and they are assured their safety in any kind of circumstances. This write up is written to list top 10 highest paid government officials in India. The President (Rashtrapathi) of India is the Head of state and the formal head of executive, legislature and Judiciary and the commander-in-chief of India. The President rakes 2nd highest salary of all the government officials. President of India gets consolidated salary of Rs. 150,000. He is entitled to have various allowances and benefits. Chief of the Executive and Government, Chief Adviser to President, Head of the councils of Ministers and the leader of the majority party in the parliament, Prime Minister is the most required person for a country’s welfare. Prime Minister earns monthly salary of Rupees 160,000 excluding the allowances. He gets sumptuary allowance of Rs. 3000 per month, daily allowance of Rs. 2,000 and constituency allowance of Rs. 45,000. He gets assured security by the government of India. He is elected by the people of India. The constitutional head of an Indian state, Governor is appointed by President of India for five years. All the executive actions for the state is taken by Governor of the state. Governor is entitled with various emoluments, allowances and privileges. 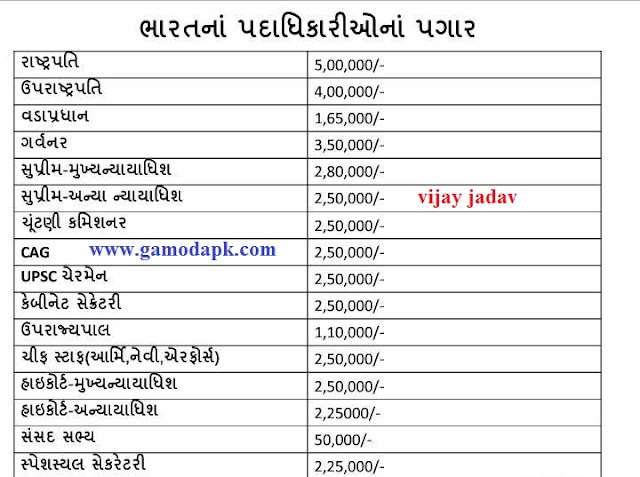 In addition to the monthly salary of Rs. 1,12,000, the governor gets official residence, free household facilities and conveyance. The governor and his family are given free medical treatment for life. Highest Ranking judge in the supreme court of India, Chief Justice of India holds the highest judicial position and is responsible for the allocation of cases and appointment of constitutional benches. Chief Justice is appointed by the president of India. The Parliament of India has the power of deciding remuneration of Chief Justice. They are being paid Rs. 1 Lakh monthly. The allowance and pensionary benefits are also given to the Chief Justice. Judges of high courts and supreme court judges are paid lucrative salaries and are regarded with allowances and benefits. Judges of Supreme Court earns in the range of Rs. 30K – Rs. 90K per month and High Court Judges the similar salary as supreme court judges. They are entitled to have allowances benefits and pensionary plans. Salary for Chief Justice and other judges in the High Courts are fixed at Rs.90,000+ Allowances. Chief Executive of India’s Central Bank, Governor looks after monetary policies and transactions. Currency of India issued by RBI bears the signature of current Governor. RBI governor is entitled to the salary of Rs. 1.28 Lakh and regarded with allowances and pensionary benefits. Salary and allowances to Members of Parliament excite general public to know what all do they get. MPs are raking enough of the amount to live a stress free life. Other than the salaries, MPs get allowances and benefits which keep them at ease. Parliamentarians are given basic pay of Rs. 50,000 excluded all other benefits and allowances. The total-fixed amount they are being paid including their allowances is Rs. 1.4 Lakh and they are also entitled to the pensions of Rs. 20,000 a month. Communications adviser in PMO is responsible for getting the PMO on various social media platforms for the first time and pioneered Indian Government’s highest office’s policy in social media interaction. Communication Adviser earns around Rs. 1 Lakh and regarded with various allowances.